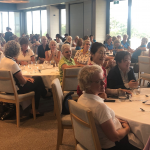 On Monday 8 April, Peninsula Kingswood hosted the first Women’s Challenge Bowl on both new courses and in the new clubhouse. 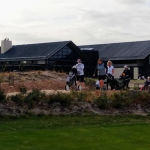 The conditions were perfect for playing golf and our visitors were impressed with our new facilities and the presentation of the courses. A few of the visiting clubs are still experiencing ongoing dry conditions at their home courses, playing on such green fairways and greens was appreciated. There were 32 clubs represented, with country clubs from as far as Benalla and Gisborne. The 128 players teed off at 8.30am in a shotgun start, the golf was completed in close to four hours. Volunteers from the PK membership and committee members, made sure everyone knew where to go and acted as spotters and raked bunkers around the course. Each visiting club had two teams, with one playing the North and one the South, the competition being Canadian Foursomes Stableford. The club with the highest combined total was the winner. There were four nearest the pins. Golf was followed by a delicious lunch served in the dining room. An entertaining speech was made by Jenny Picking (Women’s Captain) followed by the presentation of the PK Challenge Bowl to the winning team. 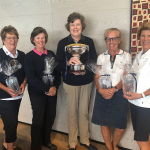 The PK Women’s Challenge Bowl for 2019, was won by Royal Melbourne Golf Club – Viv Temple, Kari Sheer, Jill Robinson and Janet Coombes with a combined total of 67 points and close behind was The Heritage Golf and Country Club – Lee Watson, Tessa Fraser, Marie Ghirardello and Lesley Cutterham with 66 points.